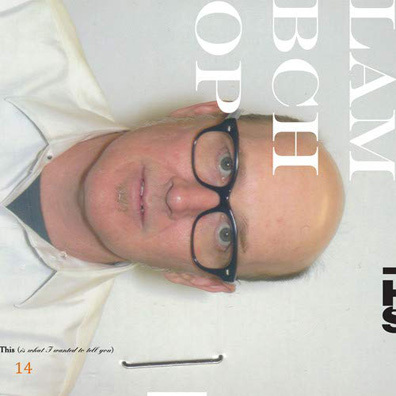 Lambchop, the Nashville alt-country/cabaret/masculine-zen band led by frontman Kurt Wagner, have released 14 albums, including their latest, This (is what I wanted to tell you), each of which utilizes Wagner's signature baritone vocal delivery as a sort of totem pole, building atop with lush guitar arrangements, tight but often jaunty rhythm sections, and peculiar synthesizer and brass/string bits. But to listen to a Lambchop record is kindred to meditating while the world runs wild around you. Lambchop's music requires minimal effort from the listener-Wagner and his counterparts do all the work for you. These songs, which over the last 25 years have remained in a similar vein but ultimately progressed and furthermore impressed, radiate melancholy. However, Wagner channels his blatantly melancholic spirit for something more leftfield and lonesome (and perhaps all too plodding) on This (is what I wanted to tell you), distorting his voice with Auto-Tune and glitched electronica pairings. Without a doubt it's a strange move for Lambchop, but where others may fall into the middle-aged cliché of experimentation, Wagner and co. prevail, and in the process have created something idyllic and awkwardly appealing. Even über-literary song titles such as "The Air is Heavy and I Should Be Listening to You," the piano-laden tracking along with the fits of electronics pair for something almost elegant (but not quite), likewise on "The December-ish You."